THROUGHOUT THE HISTORY OF with plunger mute on the former, jazz, guitar and voice have engaged with other styles of popular music. Guitarist-singer Matt Munisteri and gui- tarist Nate Radley, whose new albums comprise this Winning Spins, both interact with aspects of pop music. Munisteri con- ducts a colloquy with the past, a sonic sèance with the songs and spirit of a pio- neering American songwriter-singer. Radley channels components of rock into some of his smart originals. In self-produced Still Runnin’ Round in the Wilderness: The Lost Music of Willard Robison, Vol. 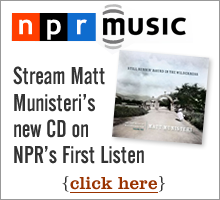 1, Matt Munisteri, resurrects songs originally recorded mostly in the 1920s by Robison, who sang, wrote, orches- trated and conducted them. Those records have never been released on LP or CD, so Munisteri accessed them from 78 rpm discs. They are weird, eccentric songs marking Robison as a precursor of such American original singer-songwriters as Randy Newman, Mose Allison and Brian Wilson. Jaunty or quasi-gospel lyrics are jostled by odd structures and unexpected harmonies. The ominous and the light- hearted snuggle side by side in one song after another. Munisteri sings in a light, affable voice reminiscent of Don McLean and plays acoustic and electric guitar firmly based in the verities of swing and early jazz. The musicians he’s assembled for this project are all fluent in early jazz styles but are hardly atavistic. Most prominent are pianist Matt Ray, who also helped with some arrangements, and trumpeter Jon Erik Kelso. Ben Perowsky, a drummer as comfortable in post-bop as trad jazz, keeps the beats snappy along with bassist Danton Boller. Scott Robinson makes notable contributions on C-melody sax and clarinet. Munisteri vocalizing along with his guitar, à la George Benson or John Pizzarelli, on the latter. There are some unique, indelible tracks on this album, a happy confluence of the strangely personal material from Robison and creative interpretations of Munisteri and company. “A June of Long Ago” is a haunting piece, very Ellingtonian in tones and textures, from the opening muted trumpet, banjo and clarinet prelude through Robinson’s woody clarinet to final choruses blending Kelso’s trumpet with Rachelle Garniez’s ethereal, wordless vocal. “Taint So,” a sort of prequel to “Ain’t Necessarily So,” struts along in a rocking shuffle until Ray’s piano solo, over a motif lifted from bowed basses in Robison’s recording, “runs the voodoo down,” in Munisteri’s words. There are many other utterly singular songs here well worthy of Munisteri’s reclamation: from the ghoul- ishly giddy “Revolving Jones” to the melan- choly lullaby “Little High Chairman.” But the one familiar Robison song gets a spe- cial treatment: “A Cottage for Sale” becomes an R&B rave up, complete with backbeat triplets, a reverb-heavy wailing guitar and angst-filled vocal from Munisteri reminiscent of Jimmy Scott.